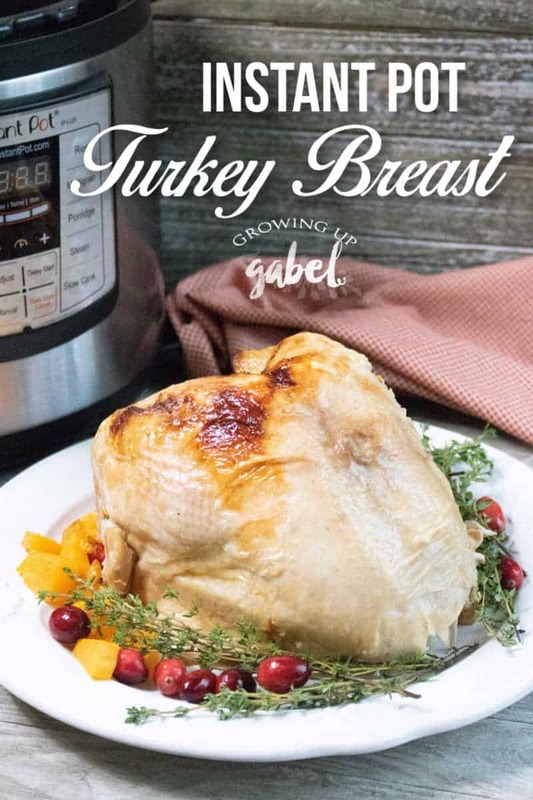 Instant Pot turkey breast recipe will revolutionize how you cook turkey. In only 35 minutes and this moist turkey breast is ready to eat. Do you remember cooking your first turkey? It can be a little overwhelming making sure you leave enough time to cook it and keep it moist. Learning how to brine a turkey will keep a whole turkey moist. But getting up super early to get in the oven is not the best part of Thanksgiving. Cooking meat in an Instant Pot always works to keep food moist, and it takes way less time to cook pretty much everything. I have to admit, I didn't think it'd work to cook enough turkey in an Instant Pot to feed a family, but it works like a charm. It keeps the turkey really moist and the oven free for other things like homemade green bean casserole. You will need a 7-8 lb bone in turkey breast with the skin still on if you want the skin. The skin isn't necessary but everyone loves that crunchy turkey skin. You can usually find these in your grocery store around Thanksgiving. Grab a few to freeze if you want to make this easy turkey dish other times of the year. First, pour the water in the bottom of the Instant Pot. For more flavor you can use chicken or vegetable broth. 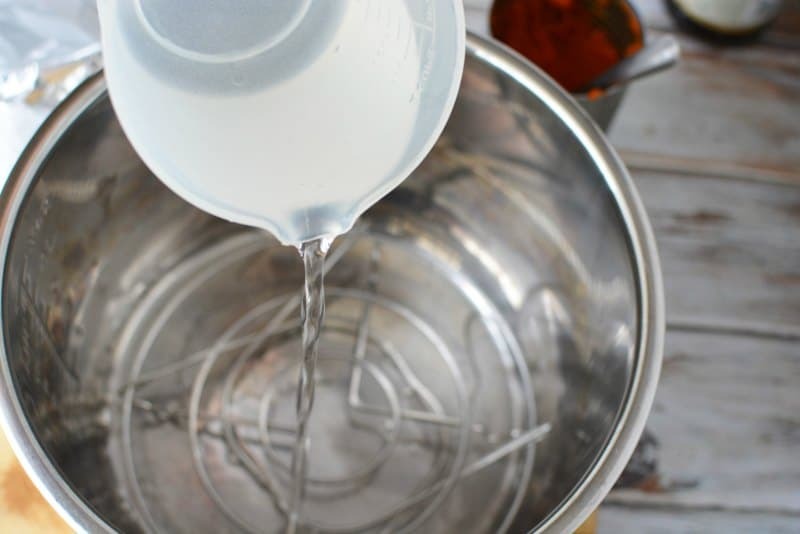 You always need liquid when cooking in an Instant Pot so don't skip this step. Next, add the spices. 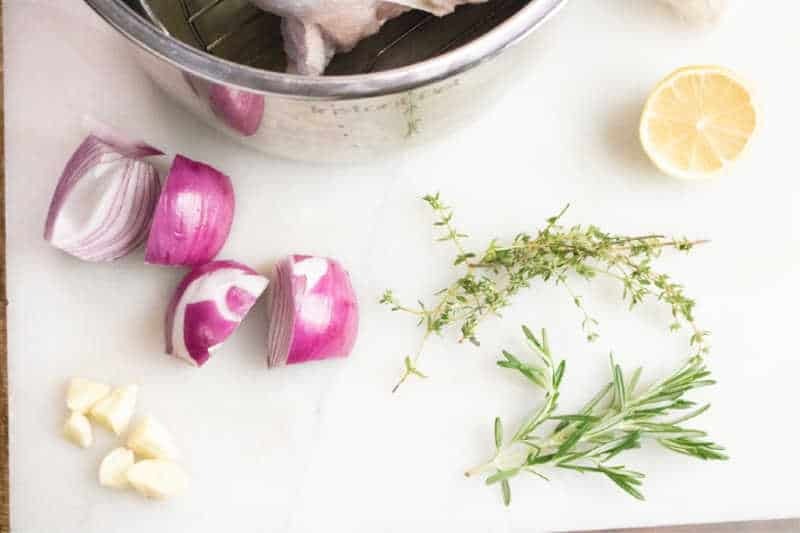 Place the fresh thyme, rosemary and garlic cloves in the water. Fresh spices are great, but if you do not have any, then use dried instead. Use about 1 teaspoon of each the rosemary and thyme. Put the trivet that comes with the Instant Pot in the bottom of the pot and set the turkey breast on the trivet in inner pot. 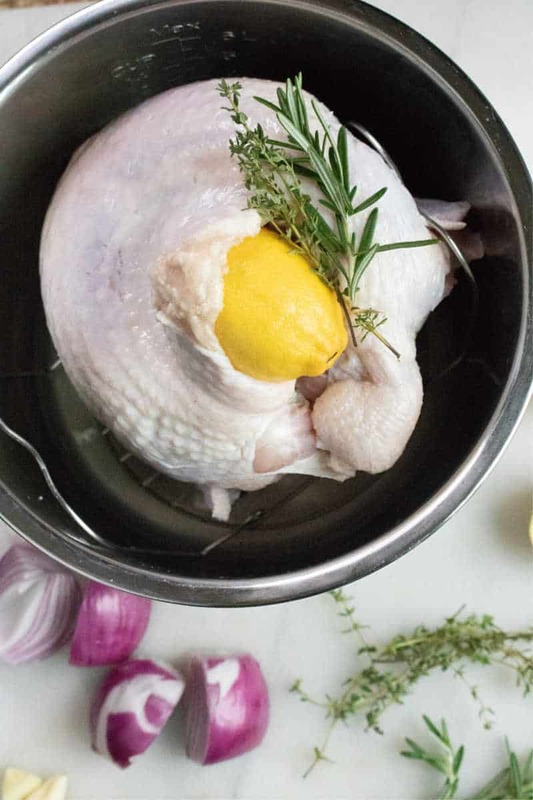 Tuck the lemon into the top of the turkey breast along with a couple of sprigs of the thyme and rosemary. 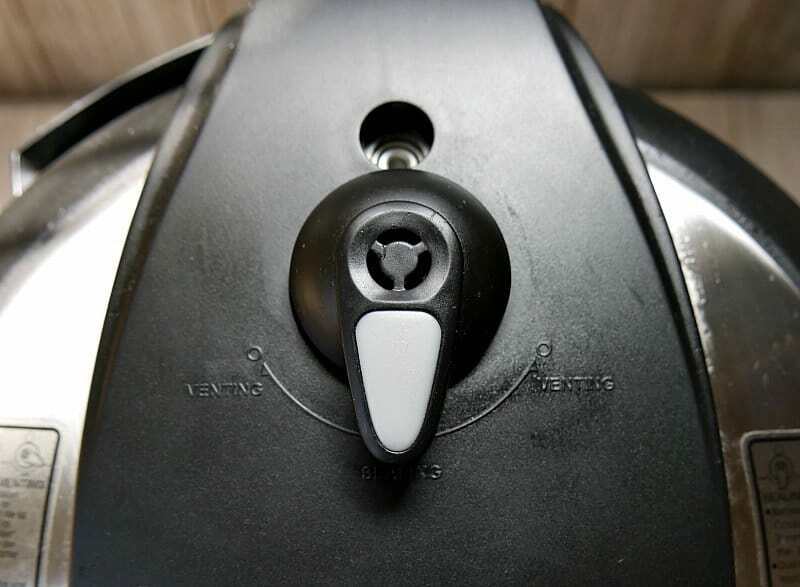 Close the instant pot lid and turn pressure valve to seal. Cook on manual high pressure for 35 minutes. The Instant Pot will take time to come to pressure. So even though the cook time is 35 minutes, the pot will need at least another 20 minutes to build up pressure. 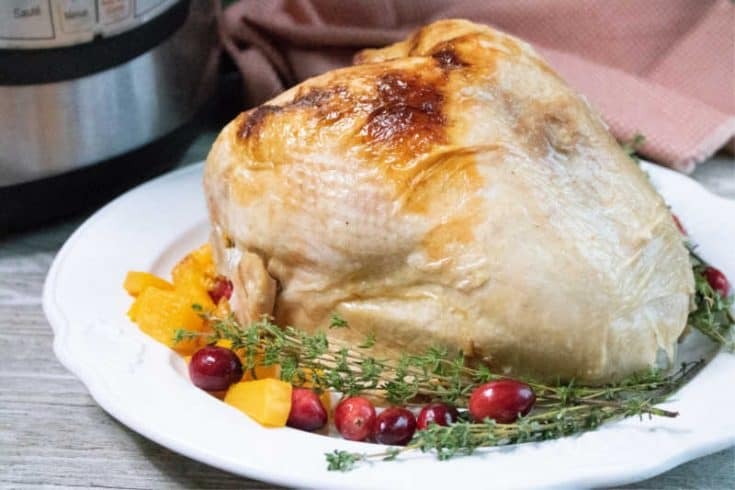 When the turkey breast is done cooking, turn the Instant Pot off and allow for a natural pressure release. Carefully remove the turkey breast from the Instant Pot and place it on an oven proof platter or other baking dish. To brown the skin, just pop the turkey breast under the broiler for a couple minutes. Place the breast on a serving platter with fresh cranberries and herbs. 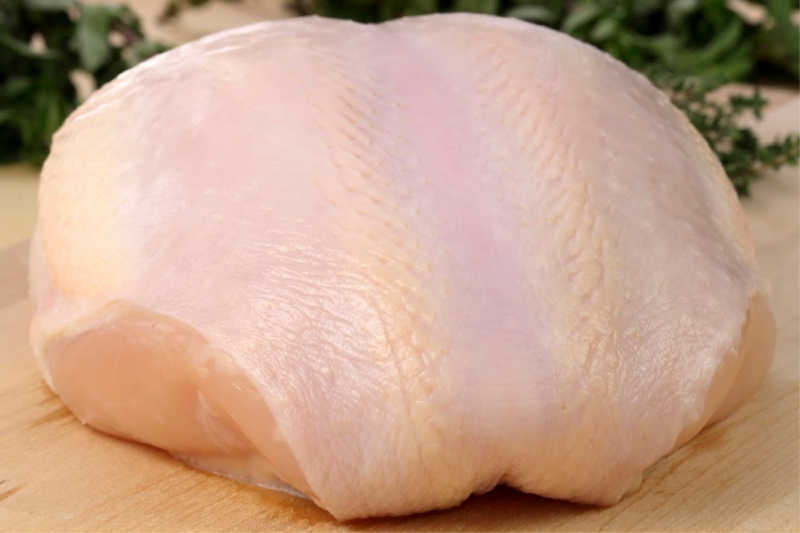 Before serving, slice the breast. Serve with a side of homemade cranberry sauce (it's super easy to make!). 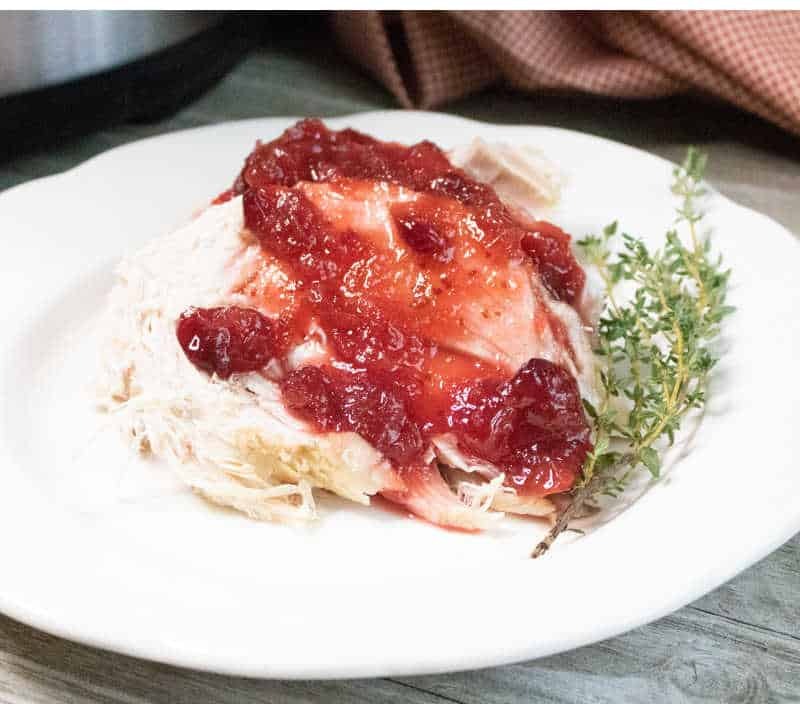 Don't stop with just the turkey in your Instant Pot! 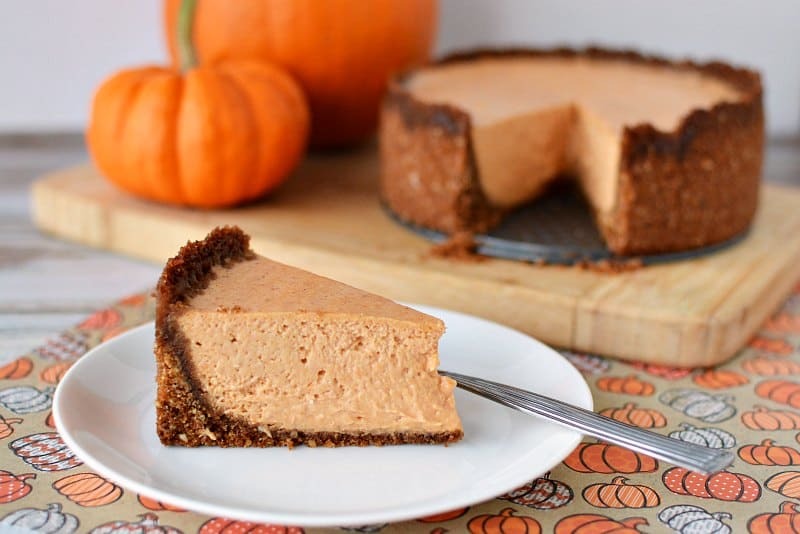 You can also make Instant Pot Pumpkin Cheesecake for dessert. Set turkey breast on trivet in inner pot. Combine remaining ingredients in inner pot of the Instant Pot. Close the instant pot lid and turn pressure valve to seal. Cook on manual high pressure for 35 minutes. Allow for a natural pressure. 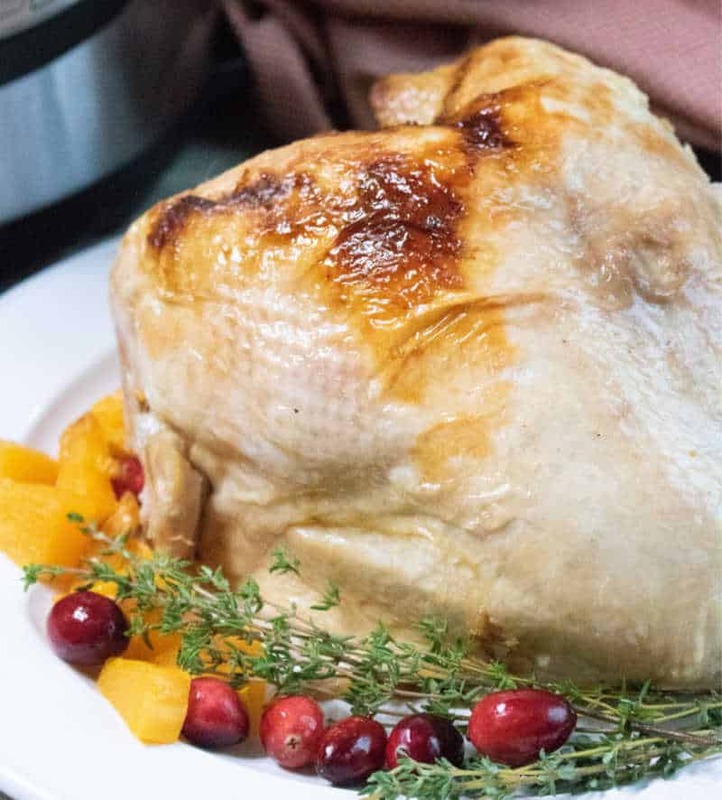 Carefully remove turkey breast from Instant Pot and place on an ovenproof dish. Broil breast for a few minutes to brown skin.